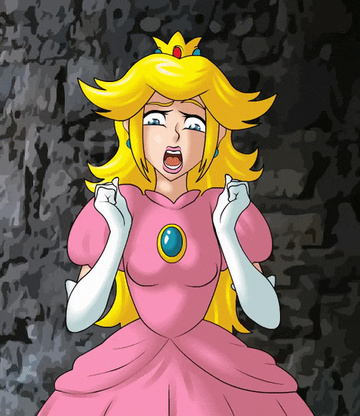 Princess Peach has long and wavy blond hair and blue eyes. She wears a pink dress, red high heels, white evening gloves, a sapphire pendant, sapphire earrings, and a gold tiara with sapphires and rubies. In sports games, Peach wears a pink skirt or pink short-shorts with a pink tank top, and pink tennis shoes. 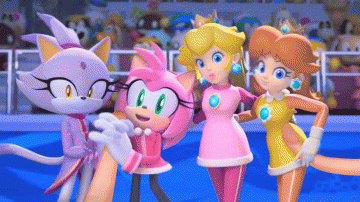 She wears various dresses, skirts, and tops in Mario Party 2. In Super Mario Sunshine, Peach wears a pink sundress, red high heels, and jewelery. She also carries a white parasol decorated with pink lace. In Paper Mario: The Thousand Year Door, when Peach is possessed by the Shadow Queen, she wears a black gown, black high heels, black evening gloves, a black cape, a ruby pendant, ruby earrings, and a pointed gold tiara with rubies. In Super Paper Mario she wears a wedding dress. She wears pink gym shorts and a pink sports bra with soccer gear and armor in the Mario Strikers series. 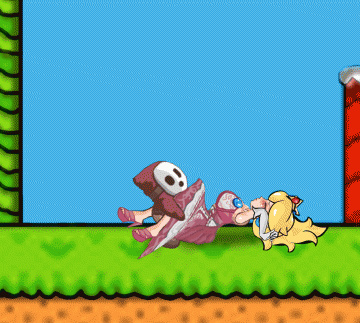 Peach's personality is generally kind natured and well mannered. In most games she is portrayed as selfless and generous. Typically, she does not show an aggressive nature even when confronted by her enemies. This however, varies from game to game. Princess Peach and Bowser in Super Mario bros.
Princess prison in Super Mario bros.